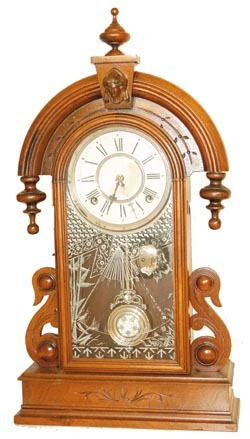 Waterbury Clock Co. parlor clock, "Paris", C. 1881. This one is about as good as you will see anywhere. Two full labels on the back, original dial, pendulum, glass, and hands. Nickel accessories include the pendulum, bell, dial rings. 8 day, strikes hours on the bell, runs very strong. Finials, who can say? As nice, clean, and original as this clock is, I will say they are original, even though they aren't identical to those in the catalogs. Ly-Waterbury #1537.